We are in the midst of a period of transformation in Healthcare: the transition from fee for service to fee for outcome. The net effect of this is cost pressure across healthcare systems, spawning programs to optimize the delivery of care, reduce cost, and find efficiencies across the board, including IT. “Do more with less” has been the mantra of Healthcare IT leaders for the better part of a decade. The healthcare systems and hospitals that achieve the greatest savings avail themselves of choice in the marketplace, almost always having more than one solution in a given category. Healthcare systems, hospitals, clinics, and practices make significant investments in Veeam and leverage a second solution to protect data that Veeam cannot. Let’s take a look at our largest customers: of Veeam’s top thirty North American healthcare customers, 64% run Epic. This is despite the fact that Veeam does not currently protect all of Epic (notably Web BLOB at scale) due to our present lack of NAS support. We also have more than 120 MEDITECH customer wins, new ones every quarter, yet we cannot presently deliver the specialized requirements to safely protect MEDITECH’s data volumes. Why would hospitals protect thousands of systems with Veeam and use a second solution for the remainder? Veeam is a case study in the value of coexistence in the data center. Veeam originally offered a solution to protect only virtual machines. When virtualization was new, it was a small portion of the data center. 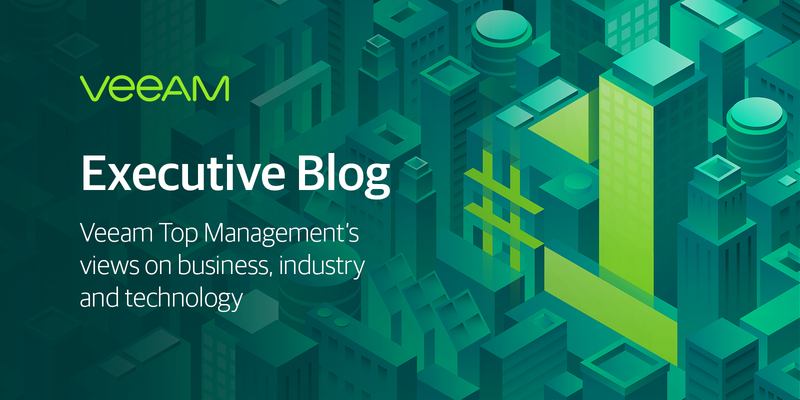 The adoption of Veeam added a data protection solution to their portfolio, and that has enabled them to capitalize on the value of choice, by expanding the solution that offered the greater value. Now with virtualized x86 representing the vast majority of the healthcare data center, Veeam customers realize substantial value — even though they continue to have needs that Veeam cannot yet meet. Veeam customers conclude that using Veeam for the 80% of data center systems and applications for which Veeam is optimally suited results in a 30-40% reduction in the total cost of data protection for those systems. That is the value of coexistence. That is the value of choice. And as our portfolio continues to expand and offer solutions to address more specific healthcare application requirements, they’ll do the math again, and that will be the primary input to their next decision. We are committed to supporting doctors, nurses, and patients by assuring the Availability of healthcare applications. We are committed to expanding the applications we protect so our customers can realize further savings whether virtualized, cloud, physical, Office365, or even AIX. The value of coexistence is quite clear: it allows the realization of substantial savings and the agile adoption of the best solution. Explore your options and see why so many hospitals continue to add Veeam to their portfolio of data center solutions. Next PostNext Cloud Data Management Just Got a WHOLE Lot Easier!